The U.S Department of Agriculture Rural Development has updated their eligibility maps to take effect for “complete” loan guarantee requests on or after February 2, 2015 in accordance with the Agricultural Act of 2014, Pub. L. 113-79. Most areas affected will be updated from rural to non-rural based on the 2010 census and are currently available on the eligibility website as “Future Eligible Areas”. 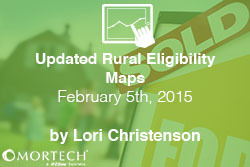 USDA Rural Development will continue to determine eligible rural areas using the “rural in character” policy. This policy allows eligibility to those that would otherwise be deemed ineligible due to their proximity to municipalities with populations larger than 50,000. Additional guidance on “rural in character” requirements is included in the Report on the Definition of “Rural” provided by USDA Rural Development. Communities under a current rural area waiver under section 541 of the Housing Act of 1949 will continue to be treated as rural for the section 502 guaranteed loans. The U.S. Department of Agriculture Rural Development provides homeownership opportunities, as well as programs for home repair and renovation. Their programs include loans, grants, and loan guarantees that are aimed at providing safe, sanitary, and affordable housing for low- to moderate-income rural Americans with reasonable credit histories.